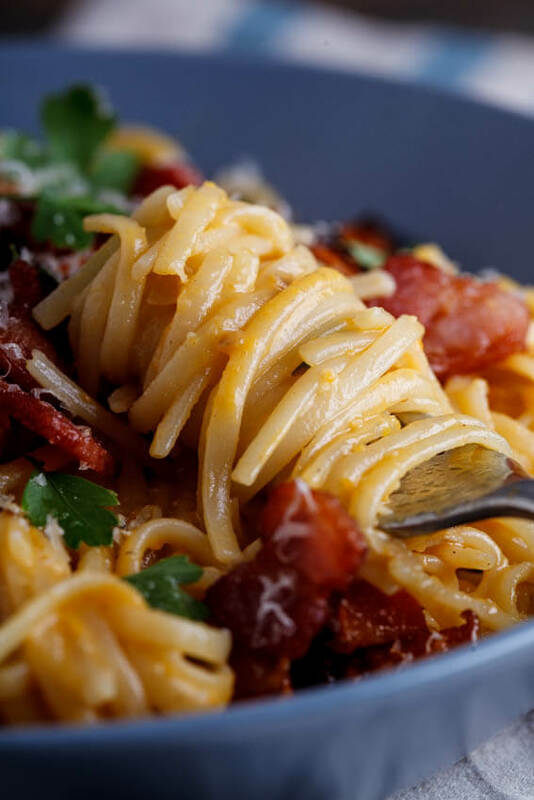 Creamy pumpkin pasta sauce flavored with honey and thyme tossed with al dente linguini, crispy bacon and grated Parmesan cheese. Woah mama! A while ago a few of my friends and I had a conversation about getting a toddler to eat vegetables. One friend mentioned that she had started pureeing pumpkin as a pasta sauce and that her very fussy little boy gobbled it all up. 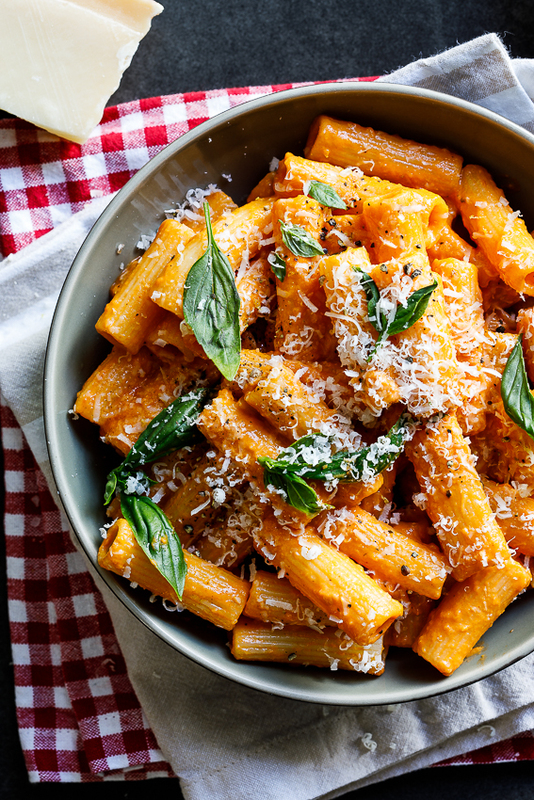 It was then that I remembered that I had been doing that for ages but not to get a fussy eater to eat their vegetables but simply because creamy pumpkin pasta sauce is just so dreamy. 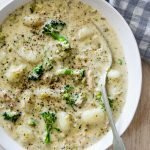 It’s also a great way to cheat your way to a creamy sauce without actually using any cream. How do you make pumpkin sauce? To get the most out of the pumpkin, I roasted it with a drizzle of honey and a few sprigs of fresh thyme until they were caramelized and sweet. I then pureed the little roasted pumpkin with a splash of milk until smooth and creamy. To add even more flavor to the sauce (and so that it’s not literally pasta in mushed pumpkin), I sautéed off an onion and a little garlic until soft and fragrant before adding the puree and a splash of stock. This was simply warmed through and just before mixing with the pasta, I added a teaspoon of the bacon fat (because, uh, why the heck not?!) and a handful of finely grated Parmesan which melted into the sauce and added serious depth and flavour. 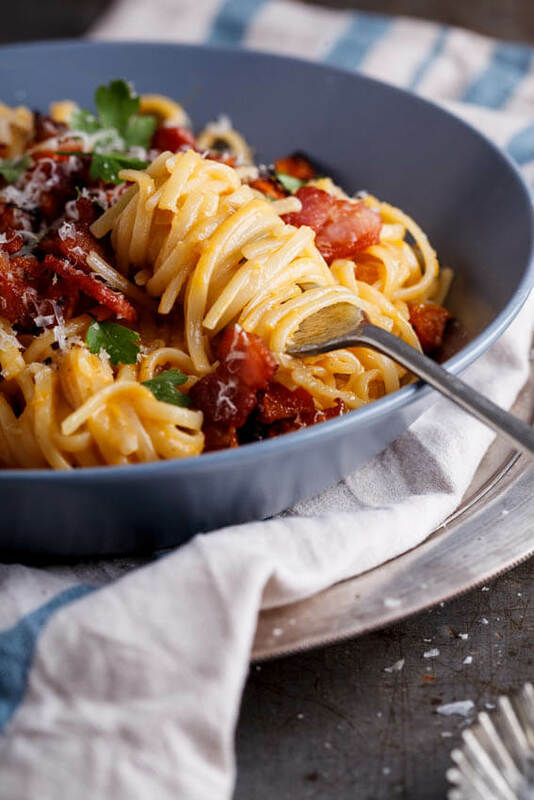 Crispy bacon bits are stirred through at the end because BACON and also because its smoky, saltiness goes so well with the sweet, earthy pumpkin sauce. 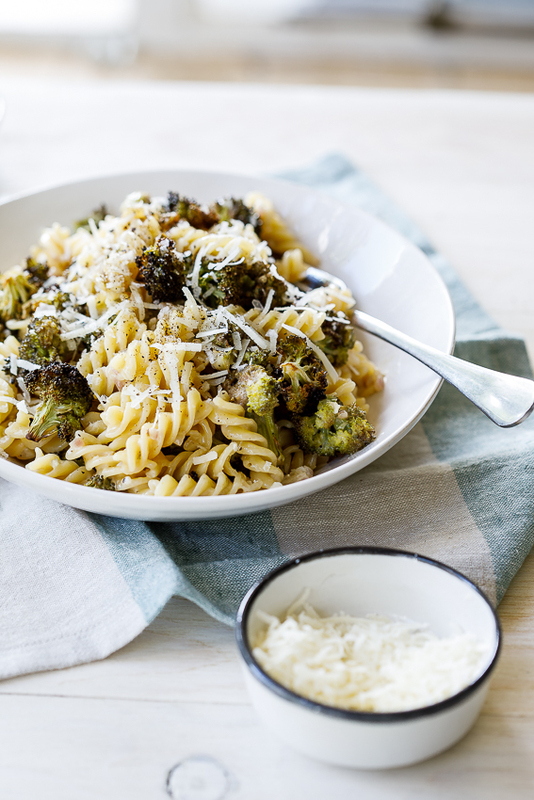 An easy, bloody delicious pasta with hidden vegetables even the fussiest of eaters will love? You’re welcome! 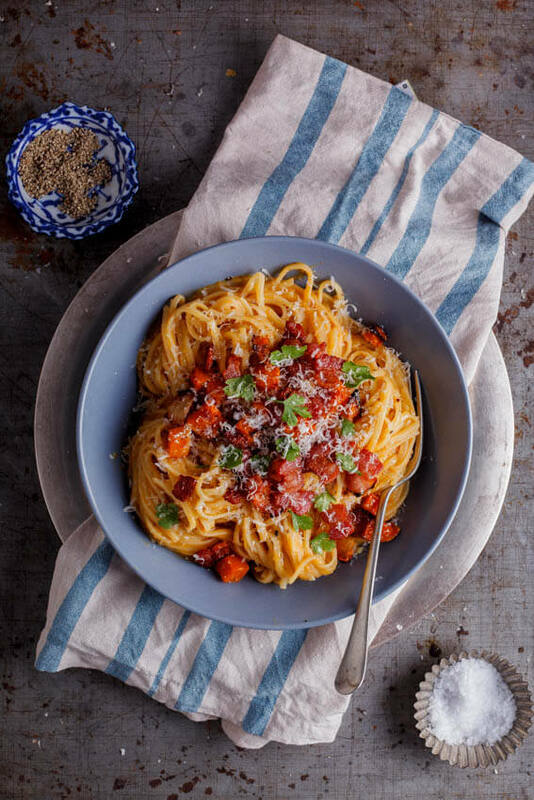 Creamy pumpkin pasta sauce flavored with honey and thyme tossed with al dente linguini, crispy bacon and grated Parmesan cheese. Remove from the heat and add the parmesan cheese. Season to taste. Stir in the cooked pasta and toss to coat well. At this stage you can add a little of the pasta's cooking water to loosen the sauce if necessary. 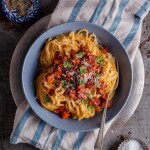 The pumpkin sauce looks so velvety and creamy! Adding the bacon is absolutely brilliant! Such a great combination of flavors! Can you use pumpkin purée in place of fresh pumpkin? If so how much would you suggest. You could, I haven’t tried it yet so can’t guarantee the end result will be the same but I can’t imagine it will be too different. I would suggest 1-1.5 cups of puree. 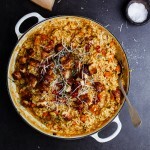 You’ve literally combined my two favorite foods into one epic dish — what’s not to love? 🙂 Good to know! It’s definitely a winner!